We are truly dedicated to helping our client with their needs and goals within the desired timeframe. It is all about you here and doing whatever it takes to get you where you would like to be. We do have a home gym with tons of machines and equipment in a comfortable and fun setting. We offer many different programs that welcome many different genders, race, or ages. Everyone is welcome. Amanda is a caring personal training that wants to make exercise a part of your everyday life by making these challenging exercises fun so that you on your off days, you are craving that work out. Anyone from beginner to advanced fitness levels may require a Personal Trainer but for different reason. You may have some specific fitness goals that you are looking to achieve and tried it on your own but have been unsuccessful, you would like to start an exercises program but you are unfamiliar with how or what exercises to do, you have never worked out before and would like to learn how, you have tried it on your own but the motivation is not there, you have been exercising for quite some time and have seen results but your body has been at a plateau for quite some time now, you are training for a sporting event, in need of some diet advice or nutrition counselling, or if you are just looking to switch up your current program. Anyone can and will benefit from having a Personal Trainer. Call today to book your free consultation!!! Each session is 1 hour long. It does include a 5 minute warm up and a stretch at the end unless requested otherwise. Contact Amanda through the contact form on the website, by email at amanda@pptandbootcamps.com or by calling 905-392-0708. 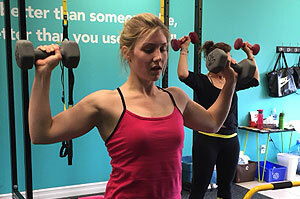 What Is A Group Personal Training? Group Personal Training is a group exercise session instructed by Amanda, PTS. Each session includes a warm up, a 45 minute work out and a 10 minute stretch. The work outs are always different and includes many different work out styles. We do Tabata training, Circuit Training, HIIT Training, Strength Training with weight, Body Weight Exercise, Plyometrics, and much more. It is a fun way to get in great shape with a group of friendly people. What Are The Benefits Of Group Personal Training? Group motivation is always a great fun way to get or keep in shape. Most clients lose about 6-10 pounds within their first 6 week program. It is a great way to meet friends that are working towards the same fitness goals as you and you can help motivate and encourage each other. Group Personal Training sessions never feels like a dreading work out, it always feels like a bunch a friends getting together to have fun and the bonus behind it is that you are being active at the same time. Another benefit to group fitness is the cost is much lower than Personal Training sessions. Team Training is Personal Training sessions with two or more people. It could be a spouse, partner, friend It is more individualized and customized towards the client as oppose to the group fitness and you get to exercise with people that have a good relationship to you. What Are The Benefits Of Team Training? The benefits of Team Training is you get to do something fun and beneficial to your health with the people you care about. You can challenge one another, motivate one another and celebrate with each other once you reach short term or long term goals. What better way to get in shape then with a family member or friend? Another benefit is the cost is lower then one on one Personal Training. What Should I Wear To The Sessions? Comfortable gym wear would be great. Shorts or pants that are easy to move around in would be best. It is very important to have a good pair of running shoes as well. A water bottle and a towel. If you have sensitive hands, work out gloves are optional. What Is The Fitness Level For The Group Personal Training And 1 on 1 Personal Training Sessions? All fitness levels are welcome to both categories. Amanda works with beginners to advanced clients to professional athletes. She gives different levels and modifications for all programs and exercises to accommodate each individuals needs. How Many People Are In The Group Personal Training Classes? There is a max of 12 people in each Group Personal Training Program, although some classes may have anywhere from 6-12 people. How Many Days Per Week Should I Commit To? A minimum of 3 times per week for any beginner clients is recommended to see results. Advanced clients should train a minimum of 4 days per week but 6 is definitely recommended. Are The Sessions For Male Or Female? Men and woman are welcome toGroup Personal Training and 1 on 1 Personal Training sessions. How Long Is The Group Personal Training Program? EachGroup Personal Training program is one calendar month long. The sessions are 3 times each week and at the same times. There is always morning and evening sessions available. What Age Group Is Permitted? 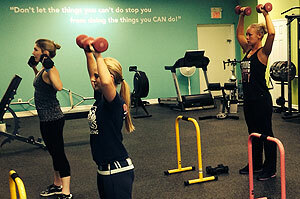 Group Personal Training allows ages of 16 and over. Parents signature required if they are under 17 years of age. Personal Training clients must be 12 years and older. Parent’s signature is required under 17 years of age. Any person under 12 years of age and requires a personal trainer can get a doctors note referring them to Amanda. Do You Have Free Trials? We do offer a 1 week free trial to anyGroup Personal Training program and a free 90 minute Personal Training Consultation. If following a healthy diet results can come fast, although this is different in every person. Clients generally see a strength and endurance increase within the first few weeks. It is the first thing they notice. They also lose 6-10 pounds within the first 6 weeks of training and of course they notice that feel good sensation that exercise always gives us. How Do I Pay For A Group Personal Training Or 1 on 1 Personal Training Session? Group Personal Training is typically paid for at the beginning of the calendar month program. Personal Training is paid monthly or biweekly. We set up payment plans for our clients. We also accept many methods of payment such as credit, debit, e-transfer, cash, cheque, or we can set up auto payments to come out of your account. What If I Cannot Make It To A Personal Training Session? What Is The Procedure To Cancel? Call or email Amanda within 24 hours of the session. If you do not give 24 hours notice, you will be charged for the session unless it was an emergency. Do Woman Get Bulky From Weight Lifting? This answer is a definite no. Due to the fact that women do not, and cannot, naturally produce as much testosterone as males do, it is impossible for a woman to gain huge amounts of muscle mass by weight lifting. There are many long term health benefits to woman lifting weight so come on ladies…lets get going??? Are You Certified To Train Pre & Post Natal Woman? Amanda is a Certified Personal Trainer Specialist. Is It Safe To Start A Pre & Post Natal Exercise Program? If you were previously exercising prior to pregnancy, it is safe to continue throughout the entire pregnancy. There are certain exercises that you should not do while pregnant and certain exercises that are beneficial during pregnancy. Hiring a personal trainer is recommended while pregnant to ensure you are exercising safely. If you were inactive prior to pregnancy, you must wait until the second trimester to start an exercises program because the neural tube of the baby is still forming during the first trimester. There are many healthy benefits for mom and baby to exercise during pregnancy and it is highly recommended. It is safe to start exercising again after the birth of the child within 4-8 weeks. This depends on if you had a natural birth or C-Section. Always get consent from your doctor before beginning an exercise program and starting with a Personal Trainer is recommended. How Can I Get Motivated To Start Or Stick With An Exercise Program? Think of what your fitness goals are and why they are important to you. For example I want to lose weight because I want to be able to play with my kids easier. Write you fitness goals down, Long term and short-term goals. Always have time frames to when you want to reach your goals by. This helps to hold you accountable to reaching your goal. Have a social support system such as friends and family that will help support you with your healthy lifestyle and can help motivate you when you need a kick. Commit to a program that best suits your needs and lifestyle and stick with it. Personal Training is a great way to start because they set you up with a program that will successfully help you reach your goals and they are there to motivate and coach you through the exercises. You also need to give yourself no excuses. For example: its too late to start exercising or I have no time ect. Remember that it is never too late. All we have in life is time, and if it is important to you, you will make the time. The only way to fail is to give up so keep with it and watch the magic happen. What Is Included In The 90 Minute Free Personal Training Consultation? This is a one on one consultation with Amanda, the Personal Trainer. It is located in a home gym in Aurora. You start with filling out some medical clearance forms to ensure that it is safe to exercises. You will spend about 30 minutes having a getting to know your trainer and going over many different categories such as your current or past health history, exercise history, your fitness goals and timeframe and how exactly you and Amanda are going to get you there. You discuss your current diet and Amanda critiques it and you get a diet guideline hand out to take home with you. 15 minutes includes a full body analysis which includes checking your current body weight, your current body fat %, and all of your body girths and measurements. 15 minutes includes a full body assessment with certain body weight exercises such as the squat, lunge, push up or chest press, pull up or seated row, a plank. and a forward fold. During this full body assessment, Amanda is looking at your form and correcting it if needed. After the assessment, you will do the exercise portion of the consultation. This is a 10-15 minute endurance and strength test which includes all body weight exercises. The final component of the consultation is the stretch component. You stretch out those muscles that were worked during the session and discuss future training with Amanda. You will Book your sessions for the next month. This is to guarantee your time slot requested over the next while. Congratulations you have made the first and hardest step to starting an exercise program.